Lincoln on Leadership: In his own story-telling style, Lincoln outlines the leadership principles that served him well. Why Gettysburg? : Why the battle came to be fought at Gettysburg and the myths surrounding the Gettysburg Address. 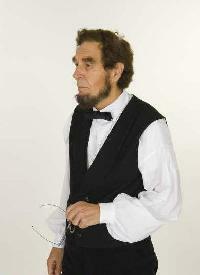 Lincoln's Life Highlights: Lincoln's life in a talk which is modified for audience age or grade level. Lincoln's Battle with Slavery: In depth review of the issues culminating in the 13th amendment. The Search for the Right General: The trials and tribulations of finding the right general to carry out Lincoln's war strategy. Lincoln's Life Lessons: Illustrated through humorous anecdotes and stories, Lincoln reveals the lessons he learned along the way. Lincoln---Lies, Legends, and Myths: The 16th President sets the record straight, separating fact from fiction. Lincoln's Love on Pennsylvania: Lincoln discusses his deep Pennsylvania roots and reasons why it is his personal "Keystone State"
Lincoln And Grant First Meeting: Performed with a Grant presenter, the meeting is conducted like a job interview.